I’ve never met Lois Lowry and I doubt she has any idea how terrific I am. But for my money time, she writes one of the few truly excellent blogs out there by authors. I mean to say, it’s not all self-obsessed twaddle. Maybe it’s because she’s already successful; Lois doesn’t feel compelled to relentlessly beat the drum of self-promotion. But actually I think it’s because her interests range far beyond her own self, and the blog reflects that. So I make it a point to swing by from time to time. 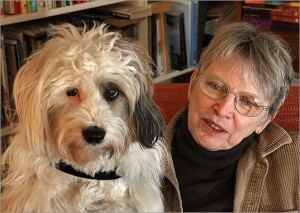 Lois Lowry, right (she’s the one in the turtleneck). Anyway, Lois used my comment as fodder for today’s blog post, provocatively titled, “Put clothes on him. But not too many.” It’s about including details — without going overboard. You should read it. That’s when I learn she’s only on the previews. It’s a basic mistake for many young writers. Too many details, too many dreary facts, most of them meaningless. As authors, we must seek the telling detail, not bury our characters under mountains of fact. I didn’t know she had a blog. For that matter, I didn’t know she had a dog. Both look awesome!